How to save almost £15,000 on a trip to the Maldives. So perhaps the title of the article is a little disingenuous, however a mate dropped me a WhatsApp message yesterday morning asking for some help. He was looking for how to get seven people (five adults and two kids), to head over the Maldives in October, travelling in business class. He said that they had already had a search online and it was looking like it would be around £25,000 worth of flights on Emirates, and British Airways didn’t have direct flights at that time of the year. 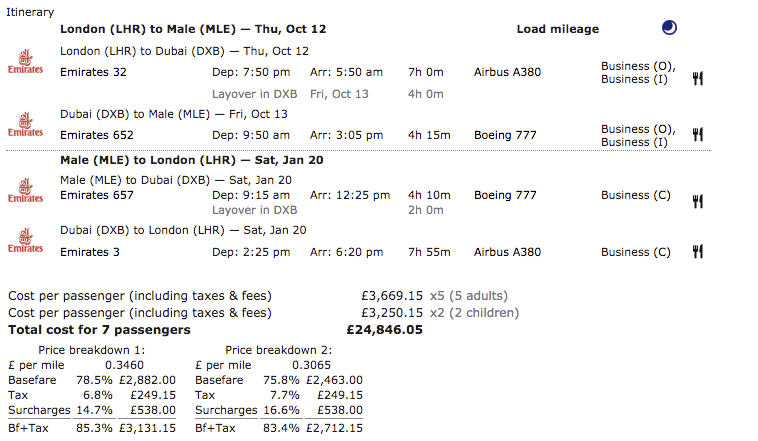 He was right, looking at the flights, it was indeed coming up at a shade under £25,000. Also, given the children were under five, they were looking for options that didn’t give multi-hour layovers at airports in the middle of the night, which was a bit of a further constraint. That also meant that an itinerary starting in Europe would have been out, as the positioning flights would have been similarly a pain for the children. So not expecting much to turn up, I plugged his dates into ITA Matrix and had a look at what it came out with. To my great surprise, there was indeed a stand out option. 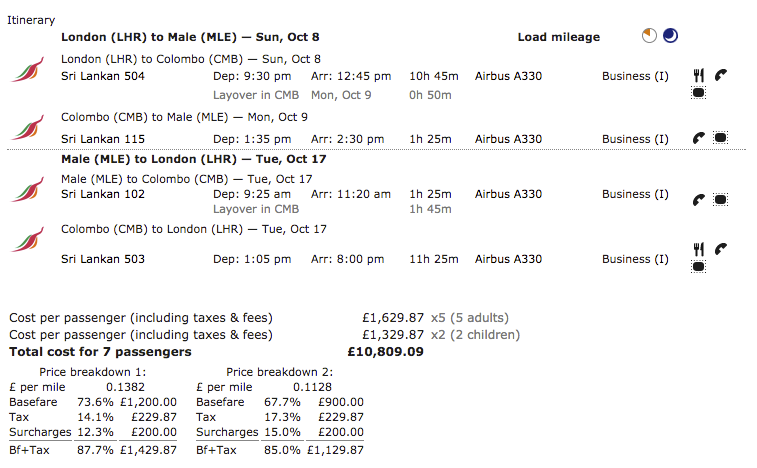 Sri Lankan airlines had a *great* fare. Looking at the options, not only was it a great fare, but there were some short connections in Colombo as well, meaning that there wasn’t going to be hours and hours hanging around. Total price, as you can see, was under £11,000 for the seven, saving slightly under £15,000 on equivalent flights with Emirates. 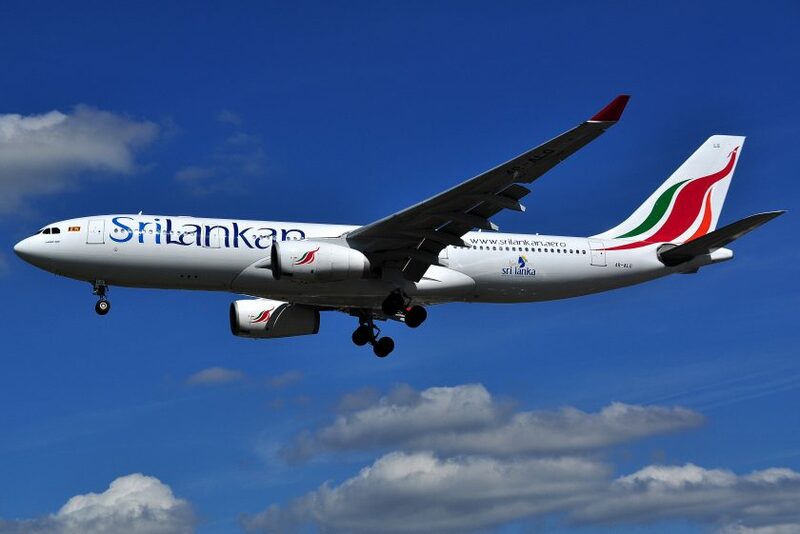 What’s also good about this fare is that Sri Lankan are oneworld members, meaning that they would all earn both tier points and Avios when credited to their British Airways frequent flier accounts; 360 tier points in total. In addition I checked out some of the penalties in the fare rules on Expertflyer. CHARGE GBP 250.00 FOR CANCEL/REFUND. CHARGE GBP 300.00 FOR NO-SHOW. NOTE - TEXT BELOW NOT VALIDATED FOR AUTOPRICING. Again, for a “cheap” business class fare, those are pretty flexible terms – worst case if for whatever reason they had to cancel the trip, they’d only be charged £250 each. Most airlines on their most inexpensive business class tickets have completely non-refundable penalty clauses. Finally, having not personally flown Sri Lankan before, I did a quick Google on their product, turning up this great trip report from the Points Guy. It turns out that they have the ‘Cirrus’ seat on their A330 aircraft which is the same as Cathay Pacific, American Airlines on their 777-300ER (and a number of others) have fitted. It’s all aisle access, fully flat and very private. The flights my friend had selected were on the A330 product the entire way. So overall, he was pretty happy. I joked that next time I see him at Heathrow in the lounge, the drinks are on him! Previous Post: American Lounges at LAX. All change. Next Post: British Airways operated by Qatar Airways.